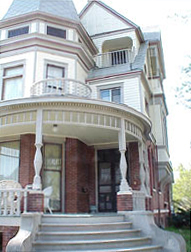 401 E. Grove:This Italianate-styled home was built for Dr. David Oliver Moore in 1874. He was educated first in Ohio and continued his studies under Dr. Emerson of Bloomington with whom he practiced medicine in 1858. During his successful 40 year career, he also held the office of City Physician of Bloomington. 409 E. Grove: General Ashael Gridley, Bloomington’s first millionaire, built this Queen Anne house for his son Edward in 1886-87. By 1903, the house was occupied by Huber Light, brother of the Broadway actress, Maude Light (Margaret Illington). She was married to Major Bowes ofThe Original Amateur Hour, an immensely popular radio show of the time. 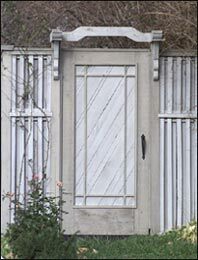 512 E. Taylor: This gate reflects the present owner’s desire to carefully blend new elements with old. In the 1800’s it was home to Wm. Dimmitt’s granddaughter, Marie Litta, an internationally known opera singer. In 1857, John Routt developed this property as a one-and-a-half story rental home. In 1912 it was enlarged to a two-story stucco house. 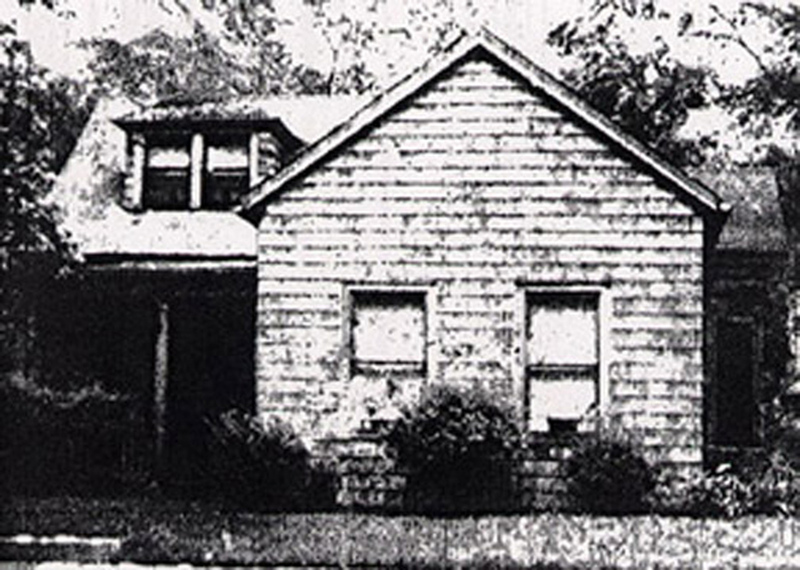 The original owner and resident of the house at 418 East Grove Street was an important figure in the history of Bloomington. Ezra M. Prince was the first General Secretary of the McLean County Historical Soceity and was perhaps the most studious of all the Society’s early officers in the research and preservation of the county’s early history. Mr. Prince’s ancestors lived in Maine in the late 18th century. John Prince, Ezra’s great Grandfather served under Captain Blake in the War of 1812. John Prince’s son, Job, was born in Maine in 1798. Job Prince had a reputation of possessing great physical courage, exemplified most dramatically in his single handed arrest of a well known desperado who had eluded the town constables of Turner, Maine. Ezra M. Prince was born at Turner on May 27, 1831. After his basic education at the common schools of the area, he was a student of Washington Gilbert, a prominent lawyer of Bath, Maine. In the fall of 1854 he entered the law school of Harvard College. After a year at the college he was admitted to the bar and in April 1856 he moved permanently to Bloomington. Ezra M. Prince held the office of Master of Chancery of McLean County for four years and served for two years as a member of the Bloomington Board of Education. He was an officer of the Bloomington Library Association, a co-founder of the Law Library of Bloomington and he taught for several years in the Wesleyan Law School. He died Auguest 27, 1908 in Bloomington. The largest and by far most important contribution by Ezra M. Prince was his extensive work done as co-founder and secretary of the McLean County Historical Society. His methods of preservation and dedication to the task of preserving information about people, events and customs of the early settlers helped to lay the foundation of the Historical Society as it exists today. During the period of the Mowrer brother’s childhood, Grove Street was a major residential thoroughfare. All the important parades, circus, G.A.R., political campaigns and torchlight processions passed by the Mowrer house. Paul recalls a visit to his house by Gordon Lily, better known as Pawnee Bill, the most famous Wild West Show owner and promoter of the day. As adults, the Mowrer brothers became noted journalists; each assigned at various times during both World Wars to the Chicago Daily News’ foreign offices. Both distinguished themselves as reporters, authors, lecturers, editors and respected leaders in their fields. Paul organized and directed the Daily News service in France from 1914-18. He was awarded the French Legion of Honor in April of 1918. 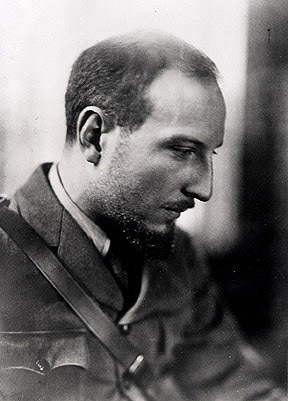 In 1929 he was awarded the First Pulitzer Prize for war correspondence. Paul Mowrer married Hadley Richardson, Hemingway, former wife of Ernest Hemingway in 1933. Along with his autobiography, he published 10 volumes of poetry. Eventually becoming a resident of the state of New Hampshire, Mr. Mowrer was named poet laureate of that state in 1968. He died in April 1971. Edgar Ansel Mowrer joined the staff of the Chicago Daily News in 1913 at the outbreak of the First World War. He was assigned to the French and Belgium fronts, then to the Italian front where he saw the fighting that paved the way for Hitler’s rise to power. His observations on Hitler’s activities and its resulting correspondence and analysis won him the Pulitzer Prize for foreign correspondence in 1933. Edgar Mowrer was one of many foreign journalists asked to leave Germany during Hitler’s increasing harassment of the free press. He continued to cover the Second World War with an important report on the fall of France, filed after his move to Lisbon in 1940-41. Edgar Ansel Mowrer died in March 1977. 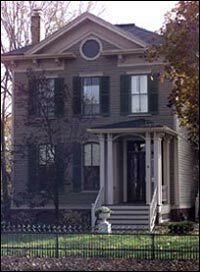 510 E. Grove: This New England sidehall house, built in 1853, became the home of Rueben Moore Benjamin. Abraham Lincoln helped him to receive his license to practice law in Illinois. He was also a part-time dean of IWU. The house was built by John Routt who later became the first elected Governor of Colorado. This is a National Register property. The house at 512 E. Taylor was built by John Routt in 1857. 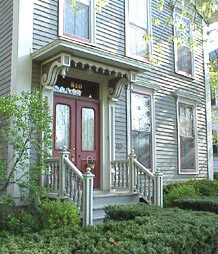 It is believed the house was built as rental property, utilizing the upstairs section. This section contained what was referred to as “sleeping beds” which suggests a dormitory type arrangement. 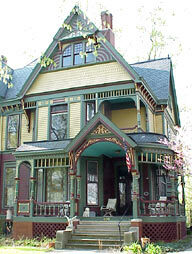 From 1878 to the early 1880s Hugo Von Elsner and Kate Dimmitt Von Elsner, daughter of William Dimmitt, occupied the house at 512 East Taylor. Hugo Von Elsner was descended from a German family. Mr. Von Elsner, a highly educated civil engineer by profession, was also an accomplished musician. Of the Von Elsner’s five children, Marie Eugenia, born July 1, 1856, displayed an impressive musical talent. Marie Litta, as she was later called, was gifted with an exceptional singing voice. With careful training by her father, she was earning $2000 a year by the age of ten. Marie was taken to several major cities to study; her places of residence during this time included the city of Chicago. Moving to Europe at the age of 18, she continued her studies with the lessons of the noted Professor Underner of Cleveland and the patronage of a Mr. Hough until her Paris debut in 1878. French critics and public alike soon referred to her as the “Queen of Song.” During this time, Marie’s name was changed to Marie Litta. With the events conncted to the Franco-Prussian war, dropping the name of Von Elsner made good sense considering the importance of her continued activities in France. Marie Litta returned to America at the close of the European Opera season the same year (1878). Embarking on an exhausting three-year performance tour, she fell ill as a result of her willingness to work far beyond the limits of her health and eventually returned to Bloomington in the spring of 1883. On July 7 of that year she died in her mother’s house on Washington Street, three blocks from where she was born. Marie Litta had just celebrated her 27th birthday. The citizens of Bloomington erected a stone monument to mark Marie Litta’s resting place in Bloomington’s Evergreen Cemetery. One inscription on the monument reads: A flower is dead. A star is fallen. A bird, singing the highest and rarest melody, has gone from the groves of that time. The current occupants of 512 East Taylor, Herb and Pamela Eaton, have done extensive re-designing and re-modeling, adding a great deal of originality and charms to this historic home. Information courtesy of Pamela Eaton and the Pantagraph Archive. 701 E. Grove: This Queen Anne style brick and frame home was designed by architect George Miller and built in 1886 for George H. Cox. Cox was the Secretary-Treasurer and General Manager of the Hungarian Roller Mill Company. He was a board member of the Corn Belt Bank and a leader of the First Presbyterian Church. 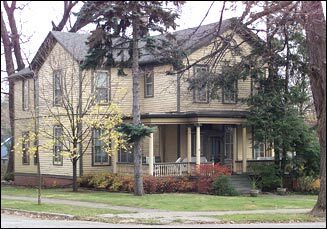 701 E. Taylor: The Scott-Vrooman home was purchased by Matthew Scott in the 1870’s. 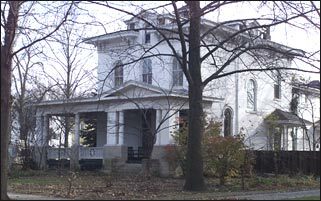 Scott’s son-in-law, Carl Vrooman, lived in this Italianate-Romanesque style home with his wife Julia Scott Vrooman for many years. Mr. Vrooman was assistant Secretary of Agriculture from 1914 to 1919 during the Wilson Administration. 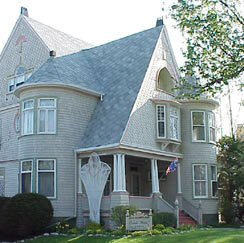 702 E. Front: This Queen Anne home was designed by local architect Arther Pillsbury and built in 1904 for Illinois Wesleyan University professor Delmar Darrah. Darrah developed and coached the men’s and women’s basketball programs at IWU. He was Grand Master of the Scottish Rite Lodge and wrote the American Passion Play, which has been produced locally since 1924.
following—for every piece of major work called out, below, there are often many precursor tasks that take a significant amount of planning, time and effort. All foundation work is complete, including reapplication of original brick to the house’s front façade, installation of original limestone window sills and the rebuilding of the house’s original limestone front porch and steps. Front porch frame, floorboards and ceiling are yet to be installed. The original basement windows will be restored/rebuilt and installed. Original limestone front walkway has been temporarily set. A footing has been poured for the front walkway steps. We’re contemplating having the Grove St. city sidewalk replaced and a driveway approach poured. Final grade has been done on the yard and we’re looking at hydro seeding part of it, in the next couple of weeks. The yard to the east of the house will not be seeded in the near future, to allow work space for contractor Gary Calhoon, who is doing roof, gutter and exterior wood repair work. This is also the area where the garage will be constructed. As evidenced by the shroud of scaffolding that has encompassed the house, since mid-July, a great deal of exterior work is in progress. The asphalt roof shingles and underlying original slate were removed and a new synthetic slate roof is being installed. Box gutters on the front half of the house have been rebuilt and all soffits have been repaired. Copper half round gutters will be installed on the back half of the house. Rotted/split cedar sidewall shingles have been re-moved and will be replaced with new cedar shingles. The 3rd floor gable on the west side of the house was recently reclad in new cedar shingles. Crown moldings and trim are being repaired/replaced when necessary. The upper stories of the west side of the house are currently being prepared for new paint. We’re hoping to paint the exterior of the upper stories this fall and work on the first floor in the spring. On the interior of the house, all electrical and plumbing systems have been replaced and meet or exceed current code standards. Duct work for forced air heating and cooling systems is also in place as are the two furnaces and two air conditioning units. Furnaces were placed in the attic and the basement to minimize damage to existing plaster walls when installing ductwork and vents—the two unit system also allows for zonal temperature control. Note: The original hot water heating system (boiler and radiators) had been removed, prior to our involvement with the house, and retrofitting a new hot water system was not feasible. The back stairs, leading to the basement, have been rebuilt. The kitchen ceiling that was lowered during a 1930s remodel was removed to allow for electrical and plumbing work, and will be returned to its original height. The ceiling in the 1/2 bath on the first floor has also been removed and will be raised. The kitchen backsplash was removed to allow for installation of electrical outlets (the countertop and backsplash, refinish work for electrical, plumbing and heating/cooling systems remains to be done. We have some live outlets on the first floor, basement and exterior of the house, but installation of remaining outlets, switches and lights awaits plaster repair in those areas. Heating/cooling vents on the second floor also await some plaster work prior to installation. Except for a lone toilet, in the 1st floor 1/2 bath, we have none of the bath/kitchen fixtures set——you guessed it, more plaster work AND tile work. November 15th marks the one year anniversary of the Oscar Mandel House’s move from its original location at 507 E. Washington, to its current home at 402 E. Grove. It’s an important milestone and one that lends itself to a moment of reflection. For years, the lots at 402 and 404-406 E. Grove sat vacant after decades of neglect and misuse lead to the eventual destruction of the remaining buildings, which occupied those sites. The lots eventually found a new use, as an informal neighborhood dog park. Meanwhile, over at 507 E. Washington, a house sat, slowly decaying. An architectural gem, once the pride and joy of the family that had commissioned it to be built, was enduring decades of neglect itself. Eventually the house sat alone, the solitary remaining home in the entire 500 block of Washington/Front Streets. The house sat in the shadow of Wesley United Methodist Church and was surrounded by a sea of black asphalt—enveloped by darkness——seemingly a reflection of the “mood” of the house—lonely, deep, dark depression——and a sign of times to come. The church eventually secured ownership of the house and the lot on which it sat, with the intent of utilizing the lot for future expansion. The church recognized the historical and architectural value of the house and choose to explore options other than demolition. What followed next was a long, drawn out, and well publicized story with lots of drama. Long story short, and a part of the story that Dawn and I have shared with very few people, is that after 2 1/2 months of very concentrated effort to determine if moving this house, that we had come to love and saw so much potential in, was economically and logistically feasible, we were preparing ourselves for the inevitable—despite our best efforts, it just wasn’t going to happen. We left town on October 2nd for a long planned weekend in Minneapolis-St. Paul. We had planned to notify the church of our decision the following week, with another in a series of go/no go house move deadlines approaching. 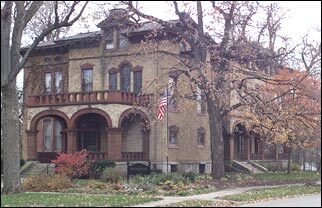 That weekend we spent a lot of time on and around Summit Avenue—for those of you who have never visited Minneapolis-St. Paul, Summit Avenue is a several mile long tree-lined residential street housing the turn of the century mansions of the city’s elite. Seeing so many beautifully preserved homes brought smiles to our faces, but at the same time broke our hearts, because we knew that that dilapidated but still beautiful house on Washington Street was destined for the wrecking ball, not for restoration to its former glory. That weekend, and Summit Avenue represented a turning point. There were hours of serious discussion and I think a few tears. Looking back now it’s all kind of a blur. In the end we couldn’t bear the thought of losing this house that we loved ——its incredible architectural features, its interior evolutionary changes pristinely preserved, its rich history. We knew that we would always regret not having done everything within our power to preservethe house. Desperate days ensued but the house did move and is currently in the process of being restored. what was on the house originally. We looked at protected areas of the house and bottom layers of paint while scraping to determine the original color palette and then selected the closest matches to period paint colors, using historical paint reference books as guides. Our focus will be on priming any remaining new wood and getting a top coat paint on the 3rd story east side and back of the house, as weather permits. We’ve been taking advantage of the extremely warm and dry Fall weather, spending the majority of our time on activities on the exterior of the house. Subsequently, there hasn’t been much progress on the interior of the house. The house is currently cleaner than it has probably been for the last 60+ years. The 2nd floor has received intensive cleaning from floor to ceiling, with several hours being spent cleaning each room—ceilings and walls scrubbed with diluted TSP, wood work washed down using Ivory soap, floors were vacuumed many times over and then damp mopped. The 1st floor received slightly less attention as we prepared for the October 22nd Restoration Tour. The house won’t be passing “the white glove test” anytime soon but you can walk across the floors without leaving footprints in the dust, and it looks, smells and feels good. With cooler temperatures approaching we recently had natural gas service activated, had the thermostat for the basement furnace installed, and started the hot water heater. Completing restoration and installation of the basement windows is high on our work priority list. We’re usually so intent on looking ahead at tasks yet to be completed that we don’t often take the time to think about or fully appreciate all that has been accomplished with the house’s restoration. On November 15th we’ll be quietly celebrating the house’s move date anniversary——reflecting on what was, what could have been and what has been accomplished——and of course we will be dreaming about what will be………. in the phrase on holiday. This single word best sums up recent activity at the Oscar Mandel House. With the arrival of inclement weather and with holiday related activities filling our calendars, the month of December seemed like an opportune time to take a break from restoration work. After more than a year of single minded devotion to all things house related, to the near exclusion of everything else in our lives, it was time to recharge, in preparation for the next round of restoration activity. gutters on the front porch have been rebuilt. Dawn and I were able to take advantage of a couple of unseasonably warm days, the week prior to Christmas, and got the fascia boards on the rear east section of the house painted, allowing for installation of the half round copper gutters. Cedar sidewall shingle replacement is complete except for that required on the side dusting porch. Crown molding for the bottom edge of the side dusting porch is being milled and must be installed before the cedar shingles are installed on the dusting porch. Remaining exterior wood repair is now reserved mainly to first story clapboards and the water table. Exterior painting on the second and third stories on the west side of the house is complete. All new wood on the remainder of the house has received at least a prime coat of paint. The north side of the house has received its first top coat of paint on the cedar shingles. During our holiday we took time to decorate the house for Christmas. With the enthusiastic help of our dogs, Lilo and Koa, we decorated a tree in the first floor reception hall— visible through those curved windows in the front east corner of the house. We also put up a feather tree in the front parlor window and wreathes on the front doors. This was only the house’s second Christmas. Oscar Mandel was Jewish, as was his grandson, Oscar Cohn, so Hanukah had previously been celebrated in the house. This year the house saw the lighting of the Christmas tree, instead of the lighting of the menorah—just one more change for the house—it seemed happy, just to be a home for one more holiday. So much to do, so little time. Who hasn’t thought the same thing at one time or another? For us it’s an ever-present thought. In addition to the demands of everyday life (work and maintaining a household) we face the challenge of restoring one home to the point where it can be occupied, and preparing 2 other homes for sale (one of which is located 40 minutes away from Bloomington). Time is definitely in short supply, especially when you consider that one of us commutes to work almost 7 hours a week. It’s easy to become overwhelmed by all of these competing priorities—so we both decided to start running again to help reduce stress. With neither of us having run in more than a year (coincidentally the same time that the house moved) we needed extra motivation to get out the door, so Dawn registered for a ½ marathon and I signed up for a marathon (it seemed like a good idea back in December when we were on hiatus from house restoration work and chunks of time were freed up for training). Balancing all of these tasks and providing quality time and effort to each is a tremendous challenge. Since our last update, the cedar sidewall shingles on the side dusting porch have been installed, as well as the crown molding in that area. The finial from the top of the turret has been residing in the basement, while we’ve contemplated what kind of paint finish to utilize on it (considerable research and field trips were involved in the decision making process). Our focus is on interior work that will allow us to gain occupancy of the house. Plaster repair around the electrical outlets and switches on the 2nd floor is underway. Once those areas have been repaired on the 1st and 2nd floors (note: outlets on the 1st floor are placed in the floors so no plaster repair is needed there) the switches and outlets can be installed. Wall and ceiling repair is currently of a lower priority. Wall repair in the kitchen and installation of a new ceiling in that room will be next on our priority list. The attic has been cleaned and shelving units have been assembled in preparation for the storage of items to be moved from our current home. Most of our possessions will be packed and stored in boxes in the attic, as restoration work continues throughout the house. We’ve been working on doing some interior painting in Dawn’s unoccupied house, and hope to have it on the market in the next few weeks. On April 29th, Dawn and I traveled to Nashville, TN, where I ran the Country Music Marathon (26.2 miles) and Dawn ran the 1/2 Marathon (13.1 miles). The time and energy that the house move and restoration has required, necessitated a hiatus from running, until this past December, at which time we reintegrated running back into our lives. Running, especially distance running where you may be running for hours at a time, provides plenty of time for thinking——thinking about anything, everything, nothing. With so much work left to do on the house, during runs these days, we often think of the million and one things that we should be doing instead of running. have made many new friends as a result. We’ve gained in depth knowledge about virtually every facet of building construction, project management and general contracting. We have power tools AND we know how to use them. There are unlimited opportunities for product research/comparison (shopping!). Probably most rewarding of all, we get to see the transformation of the house from its pre-move state of neglect into something once again wonderful. covers the sills) can be installed and the clapboards on the 1st floor can be repaired. The original water table was removed from the house prior to the move, and portions of it will be used (after some paint scraping), in the construction of the new water table. Replacement corbels for the east side of the house and the front porch have been cut and are awaiting installation. Flashings on the interior of the 2nd floor dusting porches, and on the top reveal of the main staircase window have been installed. walls and ceilings where the plaster keys have pulled away from the lath and cannot be adequately reattached. We’re in the process of removing plaster in those areas and securing the remaining plaster. The house surprised us a few weeks ago when the vibrations from repeated thunder claps caused the ceiling over the main staircase to fall—not our preferred method of demolition but it was quick and effective. to be two of the most enjoyable tasks related to the house. Both provide instant gratification and you can break the larger task into manageable chunks, making recognizable progress in a relatively short timeframe. When you see us painting or digging in the dirt, know that we’re rewarding ourselves for progress on the interior of the house. Moving a house is not a preferred means of preservation—the house is not, nor will it ever be the house that it was——it has a new foundation— it sits differently on the foundation being rudely forced to regain a rigid posture on the new, level foundation, after having had 110 years to settle in to its original foundation. not be reused. Basement window openings turned out to be of slightly different sizes in the new versus the old foundations, requiring that each window (all 13 of them) be resized to fit the new opening. We have completed framing for the front porch. The floor boards aren’t down yet, but we’re able to walk up the front steps, across plywood and through the front door ——something that we haven’t done since the house sat on Washington Street. Remaining exterior wood repair consists mainly of replacing/repairing 1st floor clapboards. these areas have been finished with 3 coats of plaster. Two other bedrooms received fresh finish coats of plaster. There are still some wall cracks to contend with, but nothing as daunting as those ceilings. The second floor is now ready for installation of heating/cooling system ceiling diffusers and permanent ceiling light fixtures (as soon as they are cleaned and rewired). The last few weekends we have been busy constructing the parterre on the west side of the house. Approximately 120 hours were spent on sod removal, excavation, installation of gravel paths and edging, and planting. The parterre was a lot of work (especially when you consider that every other thrust of the shovel seemed to result in the discovery of yet another brick, rock or piece of concrete), but for us worth the effort. run in the house to view the garden from the parlor and west-side bedroom windows—it makes me smile every time. We’ve been exceptionally busy at work, home and at the house. So busy in fact, that we didn’t get a chance to provide an update, on the house, in the last DGNA newsletter. for publication, at a later date (I figure at the current rate of progress you might want to look for that story to be published in say, the year 2010). turret has been scraped, sanded and puttied. Prepping the turret took longer than expected due to the work involved in stripping the ornamental metal work at the roofline. Provided the weather cooperates, we’ll meet our paint goal for the year, which was to complete painting the upper stories of the house. St. site. We will be recreating the pond, using stone from that we salvaged from the original pond, prior to the house move. floor switches and temporary keyless porcelain fixtures being installed. Several can lights were installed in kitchen ceiling. Original switch and outlet plates have been reused throughout the house and reproduction push-button switches have been installed in many rooms. creative ideas to integrate the 2 1/2’ X 2 1/2’ X 8” pier pad and post into the basement floor plan—why would we expect anything to be easy with this project? stallation in the 2nd floor bathrooms, tile repair/installation in the kitchen and installation of ceilings in the kitchen and ½ bath. I didn’t even realize it until I was well into my day… the house moved 2 years ago today (November 15th). Happy Anniversary, House! … we love you. Mid-November through the first week of January is a busy time for most people—holiday parties, family gatherings, shopping for Christmas gifts, decorating the home for the holidays—it’s a blur of activity. This holiday season we were busier than usual. In a addition to all of the aforementioned activities, we organized an afternoon of rock climbing with several friends, just before Thanksgiving, and hosted a large dinner party, at the house, afterwards. Two weekends later we braved the blizzard and drove to Bloomington (Indiana), where I ran a trail marathon. Oh yeah, we managed to get some work done on the house too! (Thanksgiving Day was spent on the scaffolding) and finished up in mid-December. The 4 color paint scheme of the house is now visible. Two windows on the east side of the house wear the dark brown sash color, and the deep red color that will be used on the 1st story clapboards, has made an appearance in the detail of the ornamental metal work at the roofline of the turret. The detail of the ornamental metal work is amazing—even now, with all of those layers of old paint stripped away, the detail cannot be fully appreciated from the ground—up close you can see that there are delicate bows connected by ribbons decorated with leaves and flowers. When we resume painting in the Spring/Summer we’ll be working on the area above the front porch and then start working our way around the 1st floor of the house. Copper downspouts have been installed. The black drainage tile will stay affixed to the bottoms of the downspouts until at least Spring. We’ll be installing an underground drainage system and the bottoms of the downspouts can then be completed. The posts on the front porch have been straightened and fastened to the limestone. The attic windows are currently being restored. The hallway ceiling, outside of the kitchen, has received new plaster, and major repairs to walls in that hallway, the reception hall, and an upstairs bathroom have been made. and areas of chipped paint to contend with before the interior can be painted). There is still a lot of work left on the interior of the house, but I think we’re beginning to see the light at the end of the tunnel—-last week we spent time making a final decision on the kitchen countertop—after 2+ years of thinking about what we’re going to do with the kitchen we’re finally to the point where we need to make decisions! We’re looking forward to a little post holiday R&R this weekend—we’re heading to Phoenix where I’ll be running a marathon and Dawn will be running a ½ marathon—after running we’ll be flying to Santa Fe via Albuquerque, to ski. Then it’s back to work. During the last house “remodel”, in the early 1930’s, the kitchen ceiling had been lowered by about a foot, presumably to facilitate the addition of radiator pipework to heat the newly enclosed 2nd floor sleeping porch which is situated directly above the kitchen. During that same remodel, a ½ bath was added between the kitchen and the servant’s staircase, in what had likely been a closet. A substantial part of the kitchen and ½ bath ceilings needed to be removed, to enable update of the plumbing system. We subsequently decided to return both ceilings to their original height. We removed the metal lath and plaster ceilings from the remodel, and installed plywood at the original ceiling height. The ½ bath ceiling was replastered, and we will be installing a tin ceiling in the kitchen. The wall void between 1930 ceiling height and new ceiling height has been repaired with fresh coats of plaster in both rooms. After much deliberation we decided that the kitchen’s ¾” square, yellow tile countertop could not be saved. There were several broken/chipped tile and a few missing/damaged bullnose tile. The matching 4 “square backsplash tile had previously been lost when we had to remove it for the electricians. Even if we had the tile reproduced (the tile size, color and bullnose profile are no longer readily available) the repairs would have been extremely difficult, as all of the tile is set in a couple of inches of mortar We came up with a lot of creative ideas on how to integrate new tile with the old, but we never came up with what we thought was a satisfactory solution. We removed the countertop using a sledgehammer and crowbars. We’ve been able to salvage a fair number of the tile for possible reuse in the new backsplash (yes, letting go is very hard for me). maintaining the “evolution of the house”, so the kitchen and pantry will retain a 1930’s feel. The stepped arch doorway design between the kitchen and pantry was replicated in the new niche. This same stepped arch pattern can also be seen in the kitchen cabinetry. Plaster repairs in the pantry are complete. subway tile. We stripped the paint off of the walls and had the walls repaired utilizing this same plaster technique. The woodwork in this room has been stripped. bell and the rope and puck lights in the kitchen. stripping woodwork in the kitchen and in an upstairs bath. Plaster repair of wall cracks throughout the house is ongoing. distances of a 2.4 mile swim, 112 mile bike and 26.2 mile run. I’m currently training for Ironman Wisconsin 2007, which will be held in September. limited financial resources, no fantastic network of building, governmental or banking resources to draw upon.. So why did we move the house? The answer came to me with unbelievable clarity——Because we thought we could. races, and did tremendous amounts of research on everything related to triathlon. She gave me endless support that summer, along with heavy doses of much needed tough love on days that I lacked the motivation to get out the door to swim, bike or run. She believed in me and made the fulfillment of my Ironman dream her quest. When I crossed that finish line in Madison we were both left believing that anything was possible——even moving a house. Ironman Wisconsin 2003 was the last triathlon that I would participate in for 3 ½ years, as I focused my energy on an entirely different endurance activity—moving and restoring a house. Ironically, it is “that house” that has brought me back to triathlon and pursuit of another Ironman finish. Dawn and I have gradually been reclaiming our pre-house move lives, making time for activities that we enjoyed before “the house” consumed all of our time and energy. We started going to the gym again; we committed to a marathon/1/2 marathon and started running again. When I began riding the bike again, last summer, with a friend who was pursuing her Ironman dream, I realized how much I missed triathlon. It wasn’t just triathlon that I missed; it was the challenge of the Ironman—-the mental and physical challenges encountered not only on Ironman day, but during months of training in preparation for the event. Most of all, I missed that feeling of accomplishment that I had when I crossed the finish line in Madison. Our house project, while full of mental and physical challenges, was not hitting the mark in terms of accomplishment, for either Dawn or myself. After 2 years of “housework”, we seemed miles away from any perceived finish line with our restoration project—we needed to find a way to recharge—rebuild momentum for the next surge of restoration work. And, the answer seemed to be the Ironman. You might find it surprising, but Ironman events are extremely popular, with event registration generally closing within 2-3 hours of opening——with registration occurring 12 months prior to the event. So, early last September I committed mentally and financially to Ironman Wisconsin. With a definitive event date goal and knowing the time commitment involved with training, come spring, Dawn and I knew that we’d have to make the most of our time during the Fall/Winter, where the house was concerned, and we did—momentum regained. Tackling an Ironman while in the midst of such a huge project might seem like an extreme way to find rejuvenation… but its not… when you think that anything is possible. Ironman training and related activities have consumed a lot of our time this summer, but that doesn’t mean that work at the house has stalled. Since our last update several small exterior projects have been completed: installation of screening over front porch windows, installation of a temporary floor and ceiling on the front porch, installation of chimney caps, installation of drip edges and shingles on the back-door overhang, installation of finial on front porch, and replacement of a couple of window sills. On the interior of the house we are continuing to work on plaster repairs (entry, pantry, ½ bath, pass-through bath) and restoration of light fixtures. The bench seats that were removed from the parlor and dining room, prior to the house move, are currently undergoing extensive restoration. In addition, maintenance of the existing landscape (lawn, perennial beds, parterre/ornamental vegetable garden) currently takes several hours a week to maintain. As the September 9th Ironman Wisconsin date nears we expect the pace of restoration activities, at the house, to decrease significantly, as the time involved in, and intensity of, training activities increases. But come September 10th (okay, realistically maybe the 11th or 12th) we’ll both be focusing on another finish line. I couldn’t understand then, and I suppose I never will understand why, there weren’t other people (lots of other people) willing to commit to the preservation of this house. The very first time I walked through the front door I thought that the house was pretty amazing— for me, it was definitely love at first sight. While not exactly in pristine condition when we first saw it, Greg Koos, Executive Director of the McLean County Museum of History, had described the house as “near museum quality”, in a 2004 Pantagraph article. In that same interview, Koos stated that the quality of craftsmanship and materials utilized in the construction of the house set it apart from most other homes EVER constructed in McLean County. Built in 1894, the house remained largely untouched after a 1909 “remodel” of the 1st floor, and a subsequent “update” of the kitchen and sleeping porch areas and the addition of a ½ bath, in the early 1930’s. The house retained virtually all elements of its “evolution”—woodwork, cabinetry, windows, doors, hardware, lighting fixtures, flooring, special plaster finishes, tile, sinks, tubs, faucets and even the kitchen stove! Time had truly stood still in this house. With the exception of a few bad repairs, some sloppy painting and lack of routine maintenance, that led to water damage and plaster destruction in a few areas, very little had changed in the interior of the house after the early 1930’s. While an old house lover’s dream in terms of remaining in such an “intact” state, the house also brought with it a high level of responsibility——the responsibility to be good custodians and faithful preservationists. We have embraced that responsibility, changing relatively little, choosing instead to restore and reuse whenever possible. For example, plaster is repaired instead of replaced with drywall, lighting fixtures are cleaned/rewired and reused, windows are restored instead of replaced, the 1932 Kohler kitchen sink has been re-porcelained and will be returned to use as will the circa 1932 Magic Chef stove, even the switch plates and outlet covers have been restored and reused. Our borderline obsession with restoring this house has made it very difficult for us to understand how a handful of items, integral to the interior design of this house, were allowed to be removed, from the house, at a time when preservation of the structure was perceived to be viable. While owned by the Wesley United Methodist Church, Oscar Cohn’s family members were allowed to remove a dining room light fixture (from the 1909 remodel which matches 5 wall sconces which the house retains), two stained glass panels from the main staircase landing (the largest and most ornate of all of the stained glass in the house), and the front door and matching beveled glass transom. Once architectural elements are removed from a building it is difficult if not impossible to find and return them to the structure to which they originally belonged. In most cases they are lost forever. If you are lucky enough to have photos/drawings of the lost items, reproduction may be possible, however original materials used in construction of the items is likely not available and even if they are, reproduction is likely cost prohibitive. In the case of our house’s missing items, we do have photos of the items, however, the glass used in each is no longer available and replication of the items with existing materials would be extremely costly, providing we could find someone to actually do the work. While we know where these items are, the Cohn family does not appear interested in returning the items to the house. Despite the fact that we had repeatedly expressed interest in reacquiring these items for the house, the Cohn family recently, without contacting us, sold the stained glass panels to a 3rd party. Luckily we were notified, by an interested party that the estate of the family member in possession of the items from the house was in the process of being liquidated. We were able to locate the stained glass and secure its purchase (at 5 times the cost for which it was sold) before it was resold on the open market. We are currently in the process of having the glass restored and refitted into its original window frames. We are very happy to be returning the stained glass to the house, but that happiness is tempered with a great deal of disappointment— disappointment that the glass was ever allowed to be taken from the house, disappointment that the Cohn family while expressing interest in the preservation of the house is not facilitating the process, and most of all disappointment in knowing that it is highly unlikely that the front door and dining room light fixture will ever be returned to the house. Since our last update, plaster repair and painting has been completed in the entry, entry closet and ½ bath. Plaster repair in the pantry and 1st floor hallway is nearly complete. Backer board has been installed on the kitchen backsplash area and we’re currently working on stripping and refinishing the upper kitchen cabinets as well as the window frames above the kitchen sink, all in preparation for the installation of the soapstone countertop. On the exterior of the house, light blocks have been installed for the back door and side porch lights, and the final replacement corbels have been installed on the front porch. While it was still warm outside we worked for several days on an underground drainage system that the house’s downspouts will empty into. Once that project was complete we had the remaining sections of copper downspouts installed—no more black plastic corrugated pipe snaking through the yard! You can’t move a house without drawing people’s attention. Houses get moved everyday, yet even if you’ve had the chance to see a house moved off of its foundation and relocated, blocks, even miles away, you’d probably jump at the chance to see this miraculous feat over and over again. House moving is just one of those hard to believe it until you’ve seen it kind of things—and even after you’ve seen it, its still kind of hard to believe. Our house has a tremendous fan base largely due to the fact that it moved—that’s not something that people get a chance to see everyday and the concept is fascinating to people. A subset of that fan base are the people who are interested in the house and its history—the fact that the house moved is of secondary importance to them—they are the people who are interested in the preservation of architecture—the people who understand the importance of the past and how it shapes our future. The diehards in this group begrudged the fact that the house had to be moved, seeing the move as a necessary evil, a means to an end—move the house or lose it forever. Moving the house could potentially compromise the structural integrity of the house and the original design of the house would be altered with the construction of a new foundation. The house’s new location would require the house to be rotated 180 degrees from its original placement—and it is obvious that the architecht’s original design took into account the spatial orientation of the house—dining room windows were designed to capture the warmth of the afternoon sun (this room now catches only the early morning sun) and the parlor, the primary room for evening entertaining and family gathering was originally designed with an northeastern exposure, ensuring protection from the cold winter winds from the west (with its current southwestern exposure, the parlor is now one of the coldest rooms in the house). Moving the house also meant moving its history—effectively relocating the lives of the people who had lived in and visited the house, or had their lives touched by these people—moving the house meant changing the fabric of the original landscape. If you’re a fan of the television show Journeyman, you’ll understand the far reaching effects that this blip in history could have. The highest form of preservation would have meant leaving the house situated on its lot at 507 E. Washington….but that wasn’t an option, and saving the house meant moving it. People in our community have formed an attachment to the house—it is, after all, a feel good story —the house was saved, the beauty of its architecture preserved for future generations, a piece of local history remains intact etc. Even if history and preservation aren’t “your thing”, it’s hard not to hold a certain fascination for the fact that this massive house was moved. I think part of people’s attachment to the house is based on the knowledge, that in today’s society, the positive outcome of the house’s story is all too rare—the house represents a victory, albeit a small one, for preservation over progress. The number of remaining structures, built in our community pre-1920, has been decimated over time. These numbers continue to dwindle as several old houses have either been razed in the last year, or are slated for demolition as the result of community development efforts (specifically the construction of new Walgreen’s locations). Dawn and I are probably overly sensitive when it comes to the destruction of old houses, since we have a house that came very close to becoming landfill. I’m particularly affected by the news that 404 E. Washington, a house in Dimmit Grove’s backyard, was recently slated for demolition (reason unknown but I’m guessing it’s related to the development of the Coachman Motel property). We can see this house out of our back windows on Grove Street, the Mandel’s would have been able to see this house from their front yard in the 500 block of E. Washington, Oscar Mandel would have walked by this house every day on his way to work—saddest of all, this is the last remaining house in the 400 and 500 blocks of E. Washington Street. Even though we took time out for some holiday merry-making, we managed to make quite a bit of progress in the last 8 weeks. We’ve been trying to work rooms to a reasonable level of completeness, realizing that if we ever want to fully move into the house, some work is just going to have to wait until later. Plaster repair and painting in the pantry has been completed. This room also required repair of the linoleum floor and repair of a portion of the baseboard. We pulled the toilet in the ½ bath in order to repair the sub-floor and repair the linoleum flooring (positioning of fixtures in this 3’X4’ was changed to increase functionality). The toilet has been reset, and once the corner sink is installed, this room will be complete. A short first floor hallway proved to be a challenge, as paint had to be stripped off of the old plaster before plaster repairs could be made. Incompatibility between early paint and newer paint has resulted in peeling paint in several areas of the house, with the hallway, back stairway and 2nd floor hallway being the worst. We’ll have to strip the paint off of the walls in all of these areas before plaster repairs can be made, and the walls can receive fresh coats of paint. On the upside, we’ve been able to uncover the paint color history of the hallway, which has been interesting—remarkably we selected 2 colors for the hallway that are very similar to colors that had previously been used, and our paint selections were made before we started the stripping process. We’ve completed stripping paint and plaster repair in the hallway, and also made some baseboard repairs. This area is ready to be painted. We’ve completed stripping the woodwork in a small bathroom area on the 2nd floor—we call it the pass-thru bath since it contains nothing but a sink and you have to pass through it to get to/from a bedroom and the bathroom. The woodwork in this room will be repainted, but had to be stripped first because of the afore mentioned paint incompatibility problem. Plaster repair is also complete in this room, so once the room is painted, the massive sink, original to the space, can be reinstalled. The vast majority of our time over the last 8 weeks has been spent on stripping and refinishing the kitchen cabinets. We’re about ½ done with the original bank of cabinets and still have the window/door frames, chair rail and baseboards to do. The challenge with this task has been that all of the woodwork in the room had at one point been painted green (likely during the 1932 remodel of the kitchen). At some point, an effort had been made to strip the woodwork and several coats of shellac had been applied, so the woodwork appeared “natural” but retained a distinct green cast. To further complicate matters, all of the woodwork in the room is oak, a very open grained wood that wants to hold the paint. After some debate about whether or not we just accept the green tinged woodwork as part of the house’s “evolution” and just clean the woodwork, touchup the shellac and call it done, or attempt to strip and refinish, we chose the latter course of action. After some research on how to achieve the best results possible, and armed with suggestions from replies to a post on Old House Journal’s online message boards, we got busy. What we’ve found to work has been multiple rounds (3) of stripper application and removal followed by through cleaning with naptha and lacquer thinner. After 24 hours of dry time, a fresh coat of shellac is applied (the shellac actually pulls the paint out of the wood grain). This process is done 3 times. On the 3rd pass, instead of re-shellacing, the wood is sanded in preparation for stain. We’re using a gel stain since gel stains tend to sit on the wood instead of absorb into it, providing maximum concealment of any remaining green paint. 3 coats of gel stain are applied, followed by 3 coats of a protective topcoat. It’s been a very labor intensive and time consuming task—so far, the results have been great—the cabinets are beautiful, I don’t know why they were ever painted. We have the upper cabinet boxes completed and we’re just finishing up those cabinet doors. The windows above the sink are also complete. We had the soapstone countertop installed the first week of January—it looks great with the cabinets and the reconditioned 1932 Kohler sink—we can’t wait to get the tile backsplash and wall-mount faucet installed. We had to reinstall a large section of kitchen baseboard after it was removed in an attempt to correct a floor settlement problem. We’ve started plaster repair of the kitchen walls, which we’ll want to paint before installing the tin ceiling, but painting won’t happen until the rest of the woodwork in the room is completed—work in the kitchen will likely be ongoing for quite some time. We have removed 2 additional windows for restoration. Removal of windows in the dead of winter is not optimal, but air infiltration with plywood up has actually been less than when the windows were in place—that’s how bad the windows were. 2 windows have been fully restored and reinstalled—those are the 2 stained glass panels that we recently re-acquired for the house. The panels have been up 3 weeks and I still stop to look at them every time I walk by the main staircase—they truly are spectacular. We’ve been trying to work rooms to a reasonable level of completeness, realizing that if we ever want to fully move into the house, some work is just going to have to wait until later (sigh). Plaster repair and painting in the pantry has been completed. This room also required repair of the linoleum floor and repair of a portion of the baseboard. We pulled the toilet in the ½ bath in order to repair the subfloor and repair the linoleum flooring (positioning of fixtures in this 3’X4’ was changed to increase functionality). The toilet has been reset, the corner sink has been installed, plaster repair and painting are complete. A short first floor hallway proved to be a challenge, as paint had to be stripped off of the old plaster before plaster repairs could be made. Incompatibility between early paint and newer paint has resulted in peeling paint in several areas of the house, with the hallway, back stairway and 2nd floor hallway being the worst. We’ll have to strip the paint off of the walls in all of these areas before plaster repairs can be made, and the walls can receive fresh coats of paint. On the upside, we’ve been able to uncover the paint color history of the hallway, which has been interesting—remarkably we selected 2 colors for the hallway that are very similar to colors that had previously been used, and our paint selections were made before we started the stripping process. We’ve completed stripping paint and plaster repair in the hallway, and also made some baseboard repairs. This area has been freshly painted. We’ve completed stripping the woodwork in a small bathroom area on the 2nd floor—we call it the pass-thru bath since it contains nothing but a sink and you have to pass through it to get to/from a bedroom and the bathroom. The woodwork in this room had to be completely stripped, before repainting, because of the afore mentioned paint incompatibility problem. Plaster repair and painting has been completed in this room. The hardwood floor has been chemically stripped, sanded an refinished. Once the massive sink, original to the space, is reinstalled, the room will be complete. The vast majority of our time over the last several weeks has been spent on stripping and refinishing the kitchen cabinets. We’re almost done with the original bank of cabinets and the windows and chair rail on the north wall. We still have the door frames and remaining chair rail and baseboards to do. The challenge with this task has been that all of the woodwork in the room had at one point been painted green (likely during the 1932 remodel of the kitchen). At some point, an effort had been made to strip the woodwork and several coats of shellac had been applied, so the woodwork appeared “natural” but retained a distinct green cast. To further complicate matters, all of the woodwork in the room is oak, a very open grained wood that wants to hold the paint. After some debate about whether or not we just accept the green tinged woodwork as part of the house’s “evolution” and just clean the woodwork, touch up the shellac and call it done, or attempt to strip and refinish, we chose the latter course of action. After some research on how to achieve the best results possible, and armed with suggestions from replies to a post on Old House Journal’s online message boards, we got busy. What we’ve found to work has been multiple rounds (3) of stripper application and removal followed by through cleaning with naphtha and lacquer thinner. After 24 hours of dry time, a fresh coat of shellac is applied (the shellac actually pulls the paint out of the wood grain). This process is done 3 times. On the 3rd pass, instead of re-shellacking, the wood is sanded in preparation for stain. We’re using a gel stain since gel stains tend to sit on the wood instead of absorb into it, providing maximum concealment of any remaining green paint. 3 coats of gel stain are applied, followed by 3 coats of a protective topcoat. It’s been a very labor intensive and time consuming task—so far, the results have been great—the cabinets are beautiful, I don’t know why they were ever painted. We have the upper cabinet boxes and doors completed. The windows above the sink are also complete. We had the soapstone counter top installed the first week of January—it looks great with the cabinets and the reconditioned 1932 Kohler sink—we can’t wait to get the tile back splash and wall-mount faucet installed. We had to reinstall a large section of kitchen baseboard after it was removed in an attempt to correct a floor settlement problem. We’ve started plaster repair of the kitchen walls, which we’ll want to paint before installing the tin ceiling, but painting won’t happen until the rest of the woodwork in the room is completed—work in the kitchen will likely be ongoing for quite some time. We have removed 2 additional windows for restoration. Removal of windows in the dead of winter is not optimal, but air infiltration with plywood up has actually been less than when the windows were in place—that’s how bad the windows were. 2 windows have been fully restored and reinstalled — those are the 2 stained glass panels that we recently re-acquired for the house. The panels have been up 2 ½ months and I still stop to look at them every time I walk by the main staircase—they truly are spectacular. The focus in the next few weeks will be completion of kitchen woodwork, walls and ceiling, and tile and plaster repair in one of the full baths upstairs. It might have seemed like a long winter for most of you, but for us it flew by……. A frozen pipe in an interior kitchen/pantry wall, in December, resulted in water in the basement, an unplanned (translation unbudgeted) visit from the plumber, and the need for fairly major plaster wall repair in the pantry. It was a little disheartening because freshly repaired and painted walls had to be destroyed in order to access the burst pipe. Since we had to revisit the pantry to do wall repairs, we decided to repair the plaster in the pantry closet and paint it, as well. Once we completed all of that work/rework and cleaned plaster dust from every surface in the kitchen/pantry area, we installed the tin ceiling in the kitchen and created a tin backsplash behind the stove. Counter backsplash GFIs were completed, a dimmer switch was added for the ceiling can lights, and we added a couple of great schoolhouse ceiling fixtures to the light show, that is our kitchen. A substantial amount of work has been done in the 2nd floor master bath. All woodwork (3 door casings, 1 window casing, a mirror frame and a transom) and door (3) paint (at least 4 coats) was stripped, sloppy drywall repairs in the ceiling and one wall were torn out and redone, and plaster repair was done on the remaining walls. Ceiling, walls and woodwork received fresh paint. Door and transom hardware and retro towel bar, tp holder and toothbrush holder have been cleaned. Since the majority of the floor and wall tile are in good shape we decided to preserve/repair (like we always do….are we stupid or what?) Copious amounts of mortar and caulk, remnants of previous repair attempts, was carefully removed from the subway wall tile with a razor blade. A large area of floor hex tile was removed around the toilet —yes, you guessed it, another poor repair attempt. The hex tile used for the old repair were poorly laid and weren’t even the same size as the original. After we tried to find the correct size hexes, for our repair work, we had a pretty good idea why the wrong size hex tile was used previously—1 ¼ inch unglazed hexes are not widely available—we had some made. Before floor tile repairs could be made a lot of prep work had to be done…. mortar had to be cleaned off of the hexes that had been salvaged and would be reused, holes in the old mortar base, created when plumbing in the room was reworked, had to be filled, old mortar had to be ground down, mortar grout lines where new tile would meet old had to be Dremeled out, and radiator pipes had to be removed. All of the radiators in the house had been removed prior to the house move (we’re not sure why—we would have liked to have kept them). The radiators had been cut out, with several inches of pipe left sticking out of many of the upstairs floors. We’ve been pondering how to remove these pipes and repair the holes where the pipes were, for 4+ years. Removing floor boards wasn’t an option in the bathroom where we were looking at pipes imbedded in several inches of mortar. We finally arrived at using a grinder to cut the pipes as close to the tile floor as possible and then used a Dremel tool with a small metal cutting wheel (actually lots of them) to cut from inside of the pipe….hours later the pipes were cut to the desired level. The pipes were corked and leveler was applied to create a base for the new tile. The floor tile will be repaired by the time you read this. Our tile installer is laying the new hex tile one piece at a time….exactly how the original floor would have been laid. Once the floor is repaired, the toilet can be set and tub faucet and shower surround installed. The sleeping porch is nearly complete. All of the woodwork in the room (7 window casings, 2 door casings and baseboard) was scraped, sanded, primed and painted. Plaster work and painting was done in the closet. The closet door was stripped and repainted. The entry door was repaired, sanded and painted. All door and closet chest of drawer hardware was cleaned. Shades have been hung on the windows. Remaining work is touchup of the stain on the skip coated plaster walls and cleaning and waxing the linoleum floor. Prior to the house moving, most of the light fixtures in the house were taken down, catalogued and boxed up. Over the course of the last 4 years we’ve been working on restoring these light fixtures—cleaning them, having them rewired and reinstalling them in their original locations. We’ve finally finished cleaning and rewiring the last of these 36 fixtures. Some of the fixtures required only soap and water and a lot of elbow grease, but others had been painted over and had to be fully disassembled and stripped. Countless hours were spent in the process of restoring these fixtures and finding appropriate mounting hardware when it was missing (we use only slotted screws in the house where screws are visible). The latest light installation included brass pan ceiling fixtures in the bedrooms, a deco globed ceiling fixture in the bathroom, and an unusual deco pendant in the pantry. The next planned project is plaster repair of walls in the master bedroom suite, and if the weather cooperates, exterior painting. Nicer weather will also get us outside planting the parterre and carpet beds and doing landscape maintenance. It’s been a long time since our last update (April 2009 Newsletter). My dad died quite unexpectedly on March 22, just 2 days after I submitted my last newsletter article. At that point, work on the house pretty much came to a standstill. There were funeral plans to make, financial matters to tend to, and family to care for. It was probably late May/early June before we hit our stride again, finding a new normalcy that now includes maintenance responsibilities for yet another house and yard (my mom’s) and new family responsibilities (my mom). Since it seems like we’re almost always at the house working, it’s not surprising that that is where we were when the phone call, from my mom, was received telling us that my dad had had a heart attack and that we should meet the ambulance carrying my dad, at St. Joseph hospital. It’s also not surprising that the house is the last place I had seen my dad. He and my mom had stopped by the day before to check out our latest projects. Dad retired from State Farm, just after the house moved, and had been involved in various projects at the house from day one. Dad continued to be employed seasonally so he was usually MIA during the winters, and in fact, last worked at the house the previous November. He’d just ended his season of employment and was anxious to see what we had ready for him to work on. Dad loved to do interior painting, mainly I think because it’s a quick, instant gratification job. We’d work weeks on plaster repair in a room, and in 2 afternoons he’d have the room painted. Dawn and I had just completed painting the last 2 rooms we’d been working on (looking for a little of that instant gratification ourselves) and had decided to start painting outside. Knowing that dad wasn’t fond of heights (or scaffolding) I told him he should just go golfing…we’d call him when we had a room ready for paint. We had just started working on the exterior of the house that weekend and had pulled out a window in the section that we were prepping for paint. I was in the basement working on that window and Dawn was up on the scaffolding doing wood repair with Abatron when the call came. It was several weeks before that window was reinstalled. The cup of Krispy Kreme coffee I’d been drinking that morning, sat on the workbench for another 2-3 months and work on the exterior of the house didn’t resume until August. To say that we lost a little of our focus is an understatement. We’ve been working on exterior paint prep and painting, on the east side of the house, for the last few weeks. Paint on the first floor of the house looks bad (okay, awful), but it is still quite resistant to removal, so we’ve added The Silent Paint Remover to our arsenal of tools. Yesterday we re-installed 4 double hung windows and 4 fixed stained glass panels that we’d removed from the dining room, to repair, re-glaze and prime. Window restoration is time consuming, but satisfying work. Most of the windows in our house (over 60) haven’t worked the way they are supposed to work for a very long time. Getting the sashes to operate the way they did when they were first installed 115 years ago is really a gratifying experience. We’ll be working on exterior painting and window restoration as long as the weather permits. Since our last newsletter update we’ve also completed the following work in the master bathroom: floor tile restoration, wall tile repair, installation of floor molding, caulking everything, faux painting of a mirror frame, and stripping and repainting 2 doors. Untold hours were spent scrubbing the linoleum in the sleeping porch, and the pantry floor had to be cleaned and re-waxed after the burst pipe incident which re- quired plaster repair in the pantry. For 80 year old linoleum, it looks pretty good! We’ve also done a couple of landscape projects since our last update. We extended our paver patio on the west side of the house and installed a drainage system in the planting bed between the house and the patio. We also extended our parterre by adding a couple of planting beds filled with boxwood and barberry (the 3 colors of the shrubs- green, red and yellow mirror the exterior paint colors of the house). Theses beds are home to a couple of lion statues that were a find at a local estate sale. I miss my dad. But when I’m at the house he’s just around the next corner, he’s the paint on the walls, the insulation in the attic, the stack of reclaimed basement bricks in the side yard. I don’t know that he fully understood my passion for preserving the house or for that matter really ever understood me. But understanding didn’t seem to prevent him from always being supportive. I’ve been asked more than once if I have ever regretted undertaking the house restoration project….my answer had always been “no”, but now I do have a regret, and that is that my father did not live to see the house completed. Ms. Blew, This neighborhood is in Bloomington, Illinois, not Indiana.